Our cabinet style vertical chart racks are ideal for hospital and long term care chart storage at the nurses station. Features include welded color coated frames, organizers and shelves. 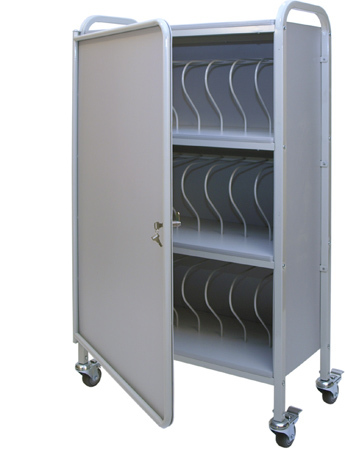 The MCBR-24L is the same design as our MCBR-24 Ring Binder Cart with the addition of a solid locking door and 1/8" semi-rigid plastic side and back panels. It features four 3" total lock casters and the rigid 1/4" rods securely support binders and charts. Holds sixteen (16) 3" binders.The MCBR-24L's design allows for clear identification and easy access. The MCBR-24L's design allows for clear identification and easy access. It features four 3" total lock casters and the rigid 1/4" rods securely support binders and charts. Holds twenty four (24) 3" binders. This chart racks is shipped assembled.